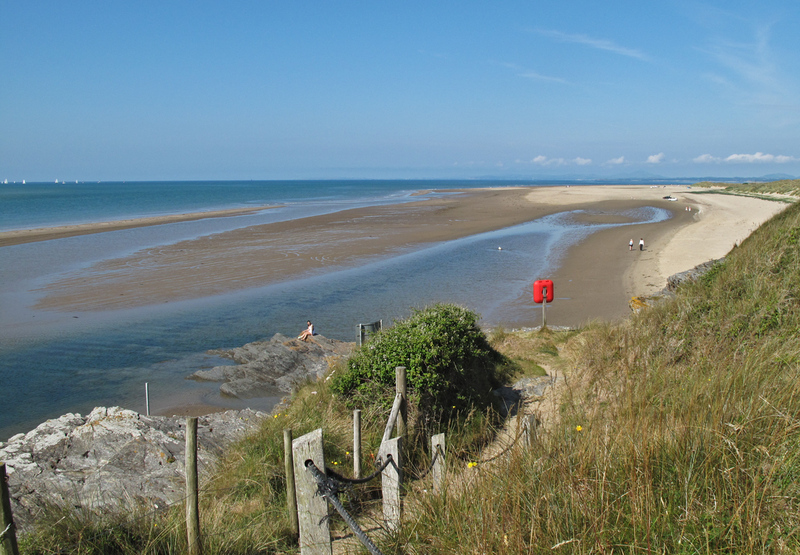 Today’s post introduces you to a beautiful area of N Wales and includes references to roofing materials and explosives. That may sound a strange mix, but read on and the connections will be revealed. Click any image in this post to see an enlargement. The Llyn Peninsula is a 30mile long finger of N Wales that projects westwards from the town of Porthmadog (on the Glaslyn Estuary), out into the Irish Sea. This coastline is home to a series of gently shelving sandy beaches and small coves; separated by rocky headlands and backed by villages and the occasional small town. It is a haven for bucket-and-spade seaside family holidays, and for people with a love of small boats and sailing. 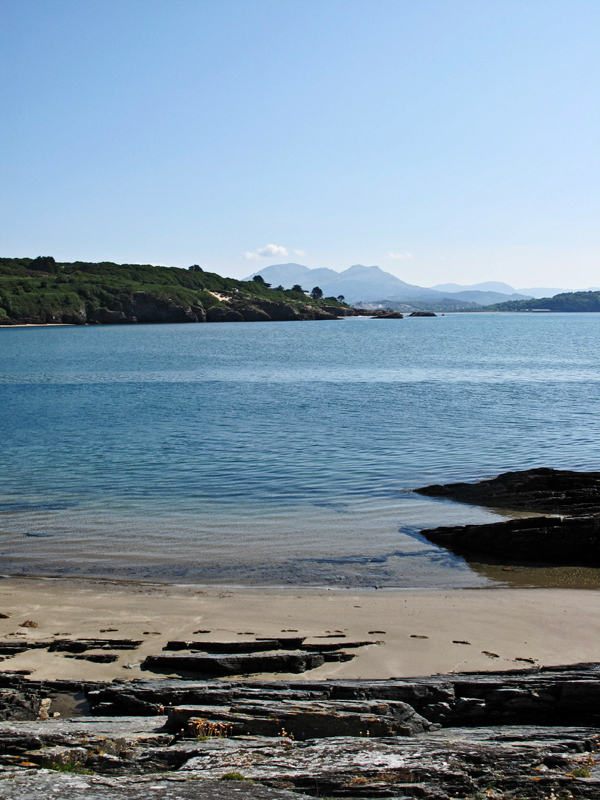 I first visited this area as a child and since then, I and my family have returned a number of times to places such as Criccieth, Abersoch and Nefyn – apart from staying inland closer to the mountains. 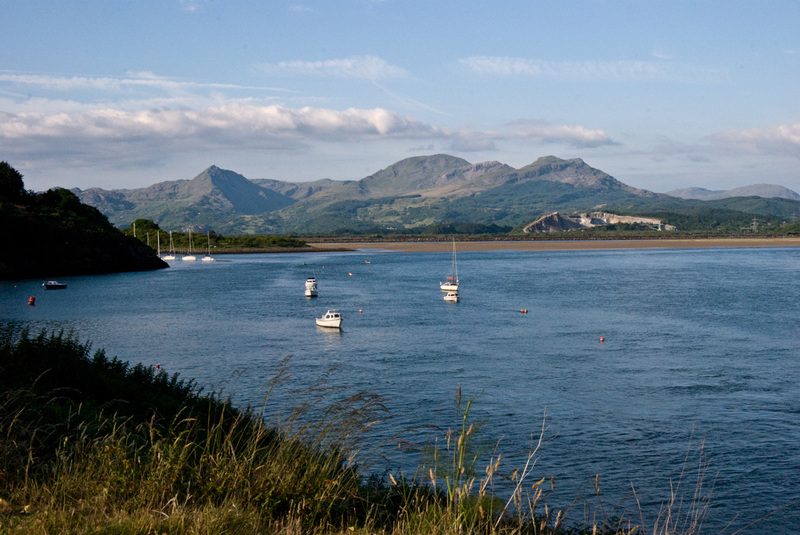 We love it, not just for the coastline but because of the way this area inter-relates with the mountains of Snowdonia. From the coast the high mountains provide a contrasting backdrop. But there is something very special about standing on a peak in Snowdonia and looking out to the sea, sometimes in more than one direction, and not only seeing the sea but glistening wide expanses of sandy beaches that are so typical of this area. That proximity adds an extra dimension to a Mountainscape, or a Seascape. Head NNE from Porthmadog in a straight line and you cross the heart of Snowdonia and after 27 miles end up on the N Wales coast just west of Conwy. The heart of Snowdonia is a surprisingly compact mountain area with some superb mountain walking, ridge scrambling, and rock climbing. Porthmadog developed during the early 19th century as a seaport for the export of slate that was brought to the port on tramways and small railways – the most famous of these being the Ffestiniog Railway. What a place to live! 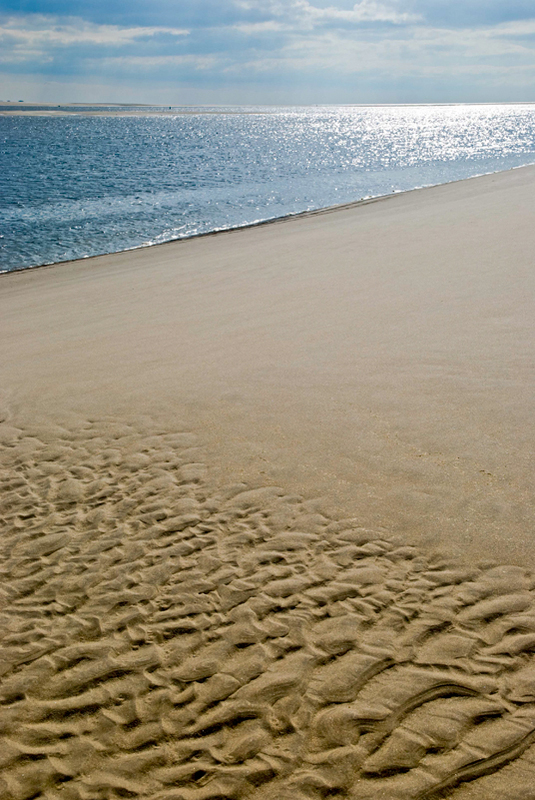 When the tide goes out you can walk directly across the sand to it. Face East from here and you can look across the Glaslyn estuary, up into Snowdonia towards the Moelwyns, or down the curve of Cardigan Bay as far as Harlech if not further. Look West and you gaze along the vast sweep of Black Rock Sands past Criccieth and its castle and on towards the end of the Peninsula. I’ve walked to this point a number of times and felt inspired by the setting of this cottage. But it has always seemed empty when I’ve been there, although I know that in the recent past it has been (and may still be) a holiday home. But what is the history of ‘The Powder House’? The clue is in its name: The ‘Powder’ is Gunpowder. Gunpowder was regularly used in the Slate Industry. 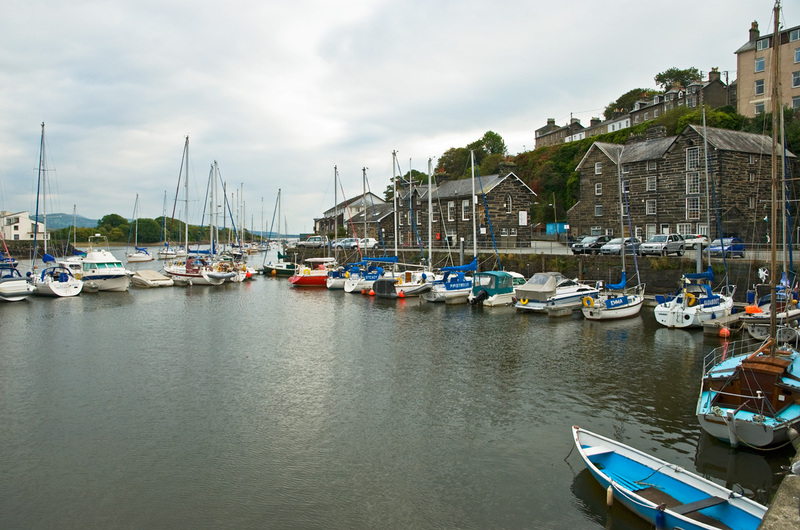 Porthmadog developed rapidly as an important seaport for the export of Slate but for obvious reasons the inhabitants were not keen on the idea of a boat loaded with gunpowder docking close to the centre of their town. 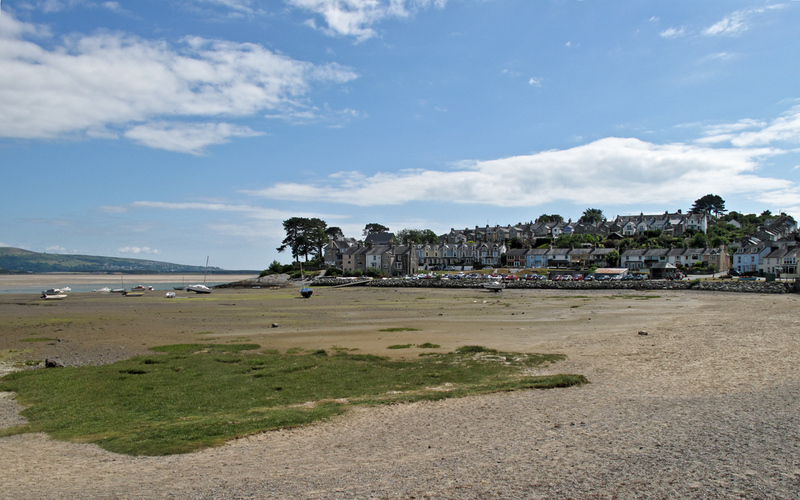 So gunpowder was unloaded at Ynys Cyngar – an isolated spot 2 miles seawards – and then transported to Porthmadog or elsewhere, originally by horse and cart. And that is why this cottage came to be known as ‘The Powder House’. 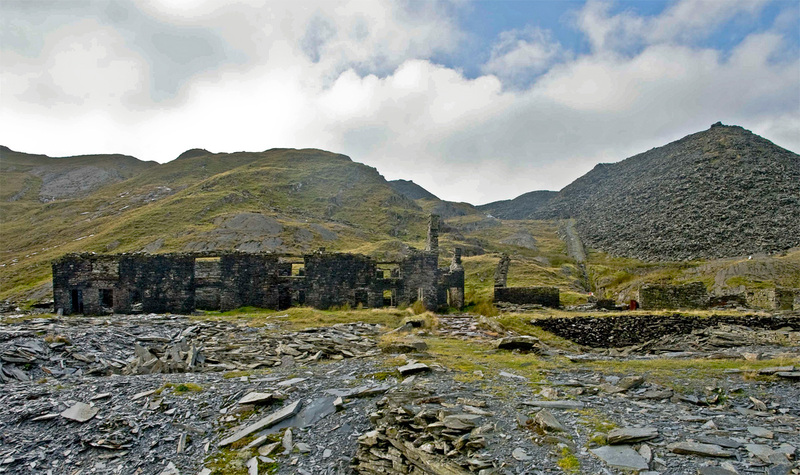 The Mountains of N Wales were quarried and mined extensively for Slate (and copper to a limited extent) from the early years of the 19th century for about a hundred years. 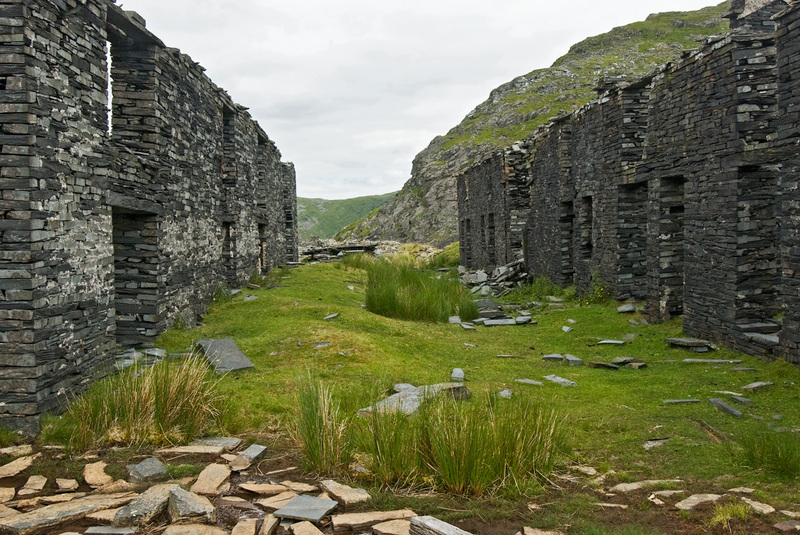 Most workings closed down in the early decades of the 20th century, but quarrying still continues to this day particularly in the Blaenau Ffestiniog area. Slate was a vital building material – whole villages and towns were built and roofed with slate. 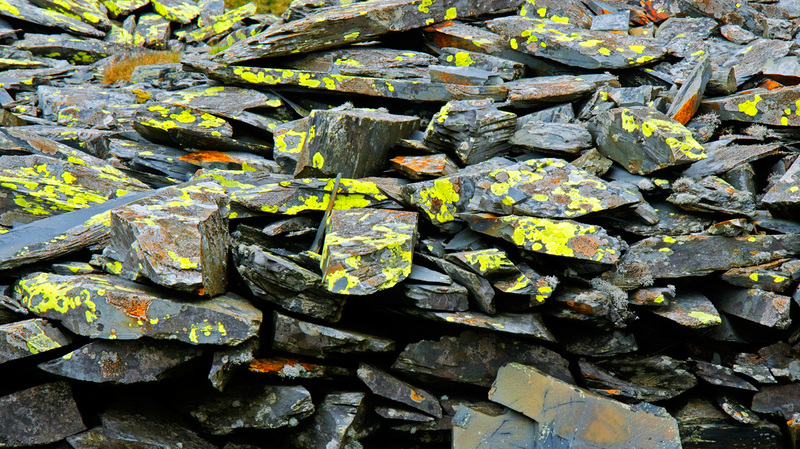 Slate walls enclosed the sheepfolds and divided the land over vast areas of Wales. Our own house is roofed with Welsh Slate. One of the quarries local to Porthmadog was Rhosydd Quarry. Click here to go to an excellent website about the history of Rhosydd. 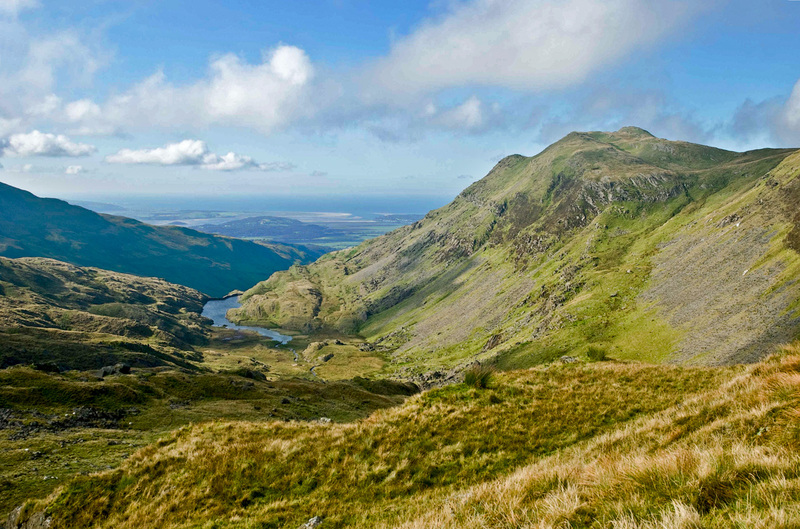 It’s situated on a high plateau between The Moelwyns and Cnicht – the prominent skyline seen in the image directly above. It closed in 1930 but the ruins of the mine workers’ barracks are still there together with the remains of rails, wagons and machinery. The spoil and detritus of the industry litters the site. Mining and quarrying were arduous work and the conditions under which the men lived and worked are hard to imagine. We tend to visit these places in the summer months in reasonable weather – but work continued year-round in conditions that at times must have been primitive and atrocious. 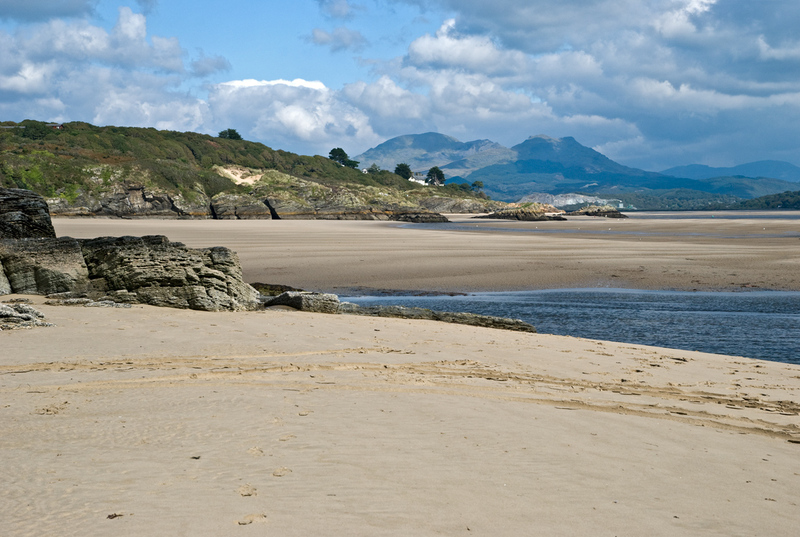 From the edge of the Rhosydd quarry, the Glaslyn estuary is clearly seen, and from Ynys Cyngar, or Borth y Gest the reverse applies. We can experience the beauty in either direction, but in the days when the quarry was active the quarrymen, engaged in dangerous and back breaking work, must have looked out at a Paradise that seemed unattainable. This entry was posted in Architecture & Buildings, Coast, Landscapes and tagged Borth y Gest, Llyn Peninsula, North Wales, Photography, Porthmadog, Rhosydd Quarry, Slate Industry, Snowdonia, The Moelwyns, The Powder House, Ynys Cyngar. Bookmark the permalink. A great post Andy, with superb images – your views towards the Moelwyns are simply stunning! I don’t know the area at all, having just driven through on the way to Llŷn. I’ll make a point of exploring next time we head that way. Thanks for commenting Paul. The southern outliers of Snowdonia are well worth visiting. I’ve had some fantastic walking around the Moelwyns, the Nantlle Ridge and around Moel Hebog. Thank you for this terrific set of pictures from a sensational part of Wales. Like you I have childhood memories of the area (Pwllheli) and I have returned a couple of times to visit Portmeirion. (I am a fan of the Prisoner!) Great memories too of scrambling up Snowdon and Trefyn with school outings/holidays. 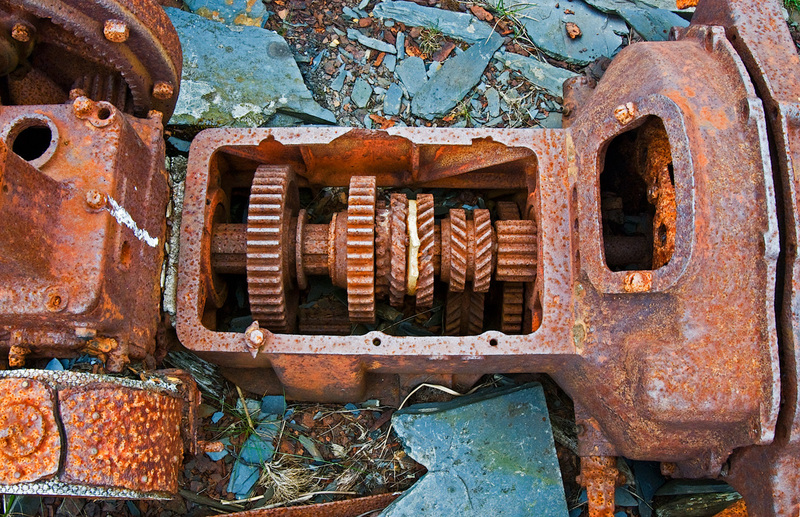 I like the detail shots, the slate and the rusted gearbox, I find it’s usually a good idea to look up, down and behind you after taking a shot, you never know what you may find. Wonderful images of Wales Andy. We stopped there as part of a cruise and took a train ride through Snowdonia about 5 years ago. It was only a day visit and now, after seeing these images, wished we had more time there. Thanks Len, Don’t we all wish we had more time! We did a fly-drive round California and another around BC, Canada. We saw a lot but barely scratched the surface of any one place. The real country is often off the beaten track too and is not obvious to the tourist with limited time. Such beautiful colors here Andy! An outstanding collection, as always! What a wonderful experience rolling through this area via your images Andy! Really well done – makes me want to go there and experience it myself! Wow, what a great post and I would be camera crazy in that place!!! Thanks for the journey, Andy: well told and nicely shown. Fantastic set of images. You should be a tour guide for the area! Thanks Marc. I once tried my hand many years ago at leading walkers up a mountain. Not much fun! Never again! Great post, Andy, and the photos are outstanding. Looks like an ideal location for a photographer to vacation. Thanks Ken for those comments. The coastline is beautiful, and if you’re bored with a beach – there are always the mountains. Two holidays for the price of one! 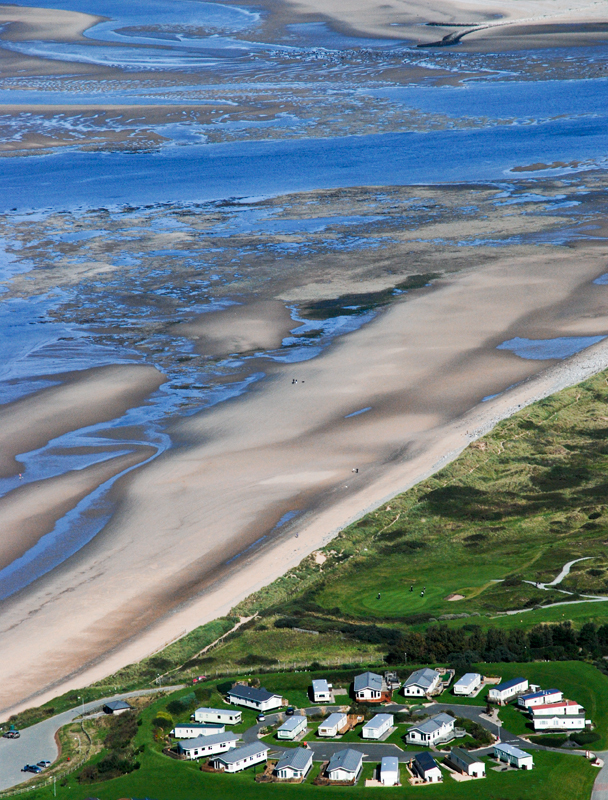 Wow, that shot of Glaslyn Estuary is amazing! I love this post! Talk about whisking the viewer away! I also really love the anecdotal stories of the area as well, they add so much dimension to your already fabulous photos here, Andy! Many thanks Toad. I was only aware of the history to the Powder House last year when I had a series of conversations with a local man about footpath access difficulties. History makes an area like this come alive, and I’ve really enjoyed putting together this story for you all. Hi, I love the photos you’ve included in this history to The Powder House. I never realised that there was an actual story behind the name. I have been to Porthmadog many times and have walked across Black Rock Sands to The Powder House. The first time I saw it, I fell in love! On looking through the windows, the walls were all just bare slate, as was the outside. I wanted that house! I reckon it must have been in the process of being renovated as the next time I saw it, it was covered in all the rendering which I suppose is still there! I haven’t been for several years now but next time I visit, I will go to see my dream home. I’m so glad I saw it in it’s raw state at the time, it was so beautiful. Many thanks for these stunning photos and the wonderful story. They brought back a lot of happy memories. I don’t know why I had never thought of ‘Googling’ The Powder House before! Kind regards. Joy. Hi Joy. Thanks so much for commenting on my Post about the Powder House. I’m so glad it brought back happy memories for you. It’s been surprising how many people have found this Post and must know something about this cottage. I first noticed it about 8 years ago I would guess, when it was rendered as it is now. I’ve never seen it occupied. Wow great post and stunning photo’s, thanks for sharing. scale of these houses (travelers?) makes amazing impression. and last shot rules, this view smells with great advenure! We walked out to the Powder House last week and wondered about the history. Thank you for giving us the information and for the fantastic photographs. Thanks so much for your comment. It just shows the power of the Internet. I am a customer of Green Thumb which adds another level of coincidence to your comment! Thanks for posting, Could I ask what camera & lenses you used?, all the best, Jon. Thanks so much for your comment Jon. Interesting to hear your reminiscences of this wonderful area. I too spent a number of happy holidays as a child in Criccieth (Black Rock sands was often visited) and Abersoch, and we returned with our children a number of times to explore the Llyn Pensinsula further. In answer to your query: most of the images were shot on a Nikon D80 with either 16-85 or 24-85mm lenses. A small number of them were shot on a Canon G10. Stunning pictures and description. I spent long summer holidays here in my youth. Very happy memories. I continue returning year after year to fish inside the estuary. Many thanks for this post, absolutely superb. Many thanks for your comment on the Post about the Powder House. 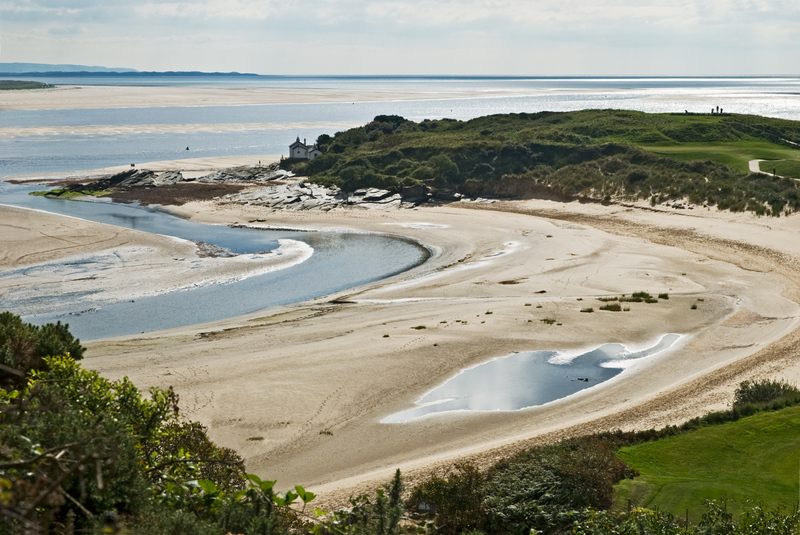 It’s attracted a few comments from people who know this beautiful stretch of coastline. I spent a series of very happy holidays as a child along this coast (a long time ago) and still return to walk in Snowdonia. Thanks very much for visiting and taking the time t make a comment.